"I have a headache." "Me too!" Nupe it, with Nuprin! Was that joke in bad taste? I hope so. It's what I was trying for. Over the years, a lot has been said about coincidences between Lincoln and Kennedy. Some of them are true and some are false. I'm going to clue you in to the true ones. 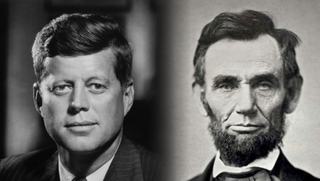 Lincoln was elected to congress in 1846, Kennedy was elected to congress in 1946. Lincoln was elected president in 1860, Kennedy in 1960. The names Lincoln and Kennedy both have seven letters. Both were forced by events to focus on civil rights. Both lost children while living in the White House. Both were shot on a Friday. Both were succeeded by men named Johnson. Andrew Johnson was born in 1808, Lyndon Johnson in 1908. John Wilkes Booth ran from a theater and was captured in a warehouse, Lee Harvey Oswald ran from a warehouse and was captured in a theater. Booth and Oswald were both killed before they could go to trial. A year before he was killed, Lincoln was in Monroe, Maryland. A year before he was killed, Kennedy was in Marylyn Monroe. You look at that list and think it's pretty amazing, right? Well, not as amazing as you'd think. A lot of these coincidences are superficial. Take the last names having seven letters. If you look at all the presidents we have had, there is an average of 6.8 letters in their last names. As for being shot on a Friday, there was a 1 in 7 chance of that. Both succeeded by southerners? Well, Kennedy and Lincoln were both from the north and needed to lock up the south to get elected. How better to do that than to select a southern running mate. Both VP's named Johnson. Well, Johnson is one of the most common surnames in America. Both were shot in the head? Well, where would you shoot someone if you wanted to make sure they were dead? In the foot? So, while the coincidences look amazing at first, if you stop to think about them, they aren't so amazing. But, who want's to think about them? I just want to be amazed.